The Mason Library maintains an English Page of relevant resources for English majors. In addition, the “Blogroll” on this course web site provides resources for students. The Oxford English Dictionary (OED): If you are looking for the definition or the history (etymology) of a particular word, or you would like to cite a definition or particular usage, consult this dictionary. You can link to the OED from any campus terminal or from your laptop. The multi-volume edition is available in the reference section in the Mason Library. Whenever you are introduced to a new author or literary movement, and you are inclined to do some background reading, please consult the concise and reliable entries in the multi-volume Dictionary of Literary Biography in the reference section. The call number is REF PN451 .D52. There are over 350 volumes to date. Recommended Electronic Resources Whenever you are introduced to an unfamiliar text, author or literary movement—or you are interested in gathering more information about a text, context or critical debate—please consider using the thousands of monographs, scholarly journals and reference texts in the Mason Library. The library makes available a range of electronic sources, subdivided into discipline-specific portals to the ongoing scholarly conversation about literature. The e-sources are available Here. It is your responsibility to know where the information is coming from. E-sources include peer-reviewed journals, web sites on particular literary sources, blogs and wikis, class notes, and so on. Twayne’s US Authors Series Online Provides concise book-length overviews of an author’s life and work. Each work includes a preface to the online edition, a chronology, a list of primary works by the author, a bibliography and citation information. For example, if you were interested in the life and work of the American poet William Carlos Williams, you will find the online version of Thomas R. Whitaker’s excellent overview William Carlos Williams first published in print by Twayne in 1968. The Collected Works of Ralph Waldo Emerson This collected works is the result of a fifty-year editorial process with the publication of the tenth and final volume of The Collected Works of Ralph Waldo Emerson (Harvard Belknap, 1971-13). 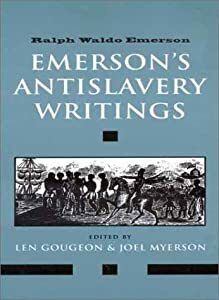 The publication of the critically edited texts is a landmark for Emerson studies, and an indispensible resource for students and scholars of nineteenth century literary and cultural history. Each volume has an introduction that offers reliable and authoritative textual and historical information. We are fortunate that Keene State College has added, at my request, this definitive edition to its holdings. The call number is PS1600 .F71. The edition is now a resource for you as a student of Emerson. Whether you are interested in his early sermons, essays and lectures, correspondence, or antislavery writing, you now have all of this textual material available. Primary and Secondary Sources in the Mason Library A general key term search in the Mason Library holdings turns up 286 entries. An author search turns up 53 entries. During the second half of the course we will spend time together in the stacks. There is much to discover. http://plato.stanford.edu/entries/emerson/ A reliable and dynamic encyclopedia. All entries and substantive updates are refereed to maintain high academic standards while evolving and adapting in response to new research. http://quod.lib.umich.edu/e/emerson/ A digital edition of the Complete Works of Ralph Waldo Emerson, Centenary Edition, edited and with notes by Edward Waldo Emerson. http://www.rwe.org/ Emerson’s Complete Works comes from the 12 volume Centenary Edition, originally published in 1903-04. The digital edition of the Complete Works of Ralph Waldo Emerson, Centenary Edition, can be searched by single word and phrase; by combinations of two or three words in a single document, page, or paragraph; co-occurrence of two or three words or phrases; or by title.